Dec. 4, 2017 11:45 a.m.
Parents across B.C. will have access to 3,806 new licensed childcare spaces over the next two years, Children and Family Development Minister Katrine Conroy has announced. Speaking in Vancouver on Monday, Conroy said the new spaces would be split among 52 communities and cost the province $33 million. This $33 million is already in the 2017/18 budget and was included in the September budget update. The province will focus on creating 1,153 spaces on school grounds, co-locating them in community hubs and will work to ensure that they are inclusive for children with disabilities. Of the 103 new projects, 61 will be new buildings and 42 will be renovations. But aside from that, the announcement didn’t come with many other specifics. Conroy deferred to her government’s upcoming February budget when asked how much it would cost parents to send their kids to the new daycares, or when parents could expect to see $10-a-day childcare, as promised by the NDP during the election. 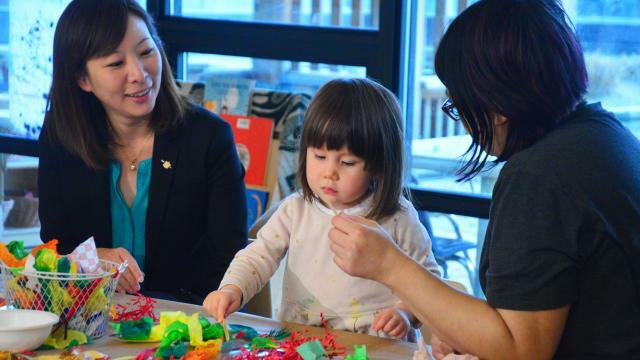 Minister of State for Children Katrina Chen couldn’t say how many parents would still be waitlisted for childcare after the 3,800 new spaces were built. Said Conroy: “We don’t have a system in the province… it’s not like healthcare. So we need a system so we can get that [waitlist] done,” said Conroy.